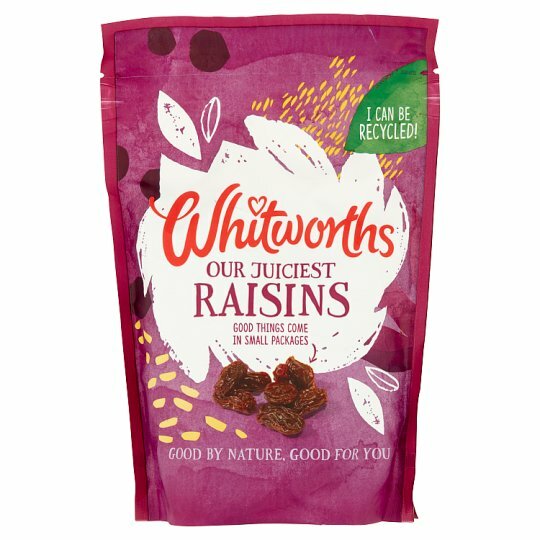 Here at Whitworths we're passionate about bringing you the very best that nature has to offer. We go to great lengths to source and select the finest ingredients, but that's not all… our expertise and attention to detail in preparing our fruits mean that you are guaranteed a tasty and delicious result with every bite! We've specially chosen the Thompson Raisin for baking as its small size ensures a nice, even distribution throughout your recipe. Also, we add in a little extra moisture so they stay nice and juicy in your bakes. Find us on Facebook, Twitter and Instagram now! Store in a cool dry place. Once opened, reseal, refrigerate and consume within 2 weeks., For best before date see base of pack.